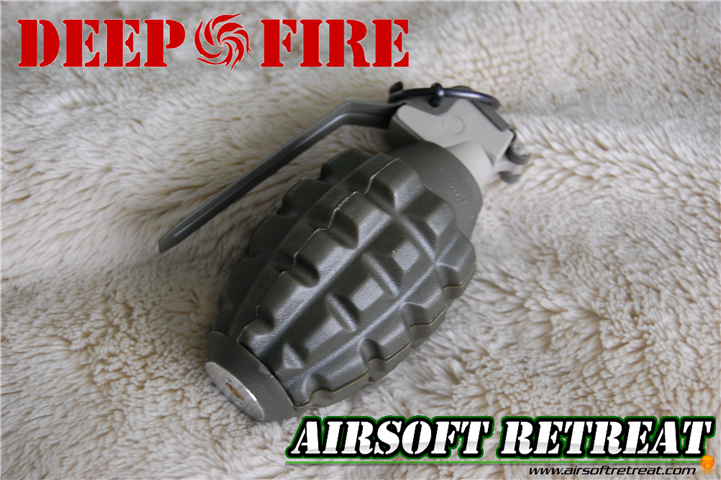 Deep Fire has been manufacturing airsoft hand grenades for years, and recently, they have sent me their MK2 model to review. Currently, they make MK2 and M26A1 models, which give you options as far as loadouts go. Today, we'll be going back in time to the WW2 and taking a tour of the MK2 grenade, so continue reading for more information on this interesting airsoft replica! 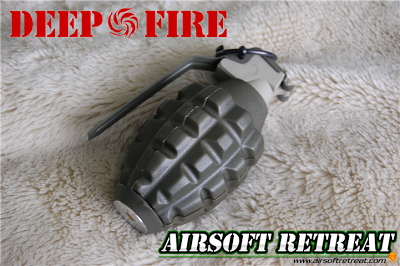 I was sent this grenade directly by Deep Fire in order to have it reviewed here on Airsoft Retreat. It is currently available at retailers such as Airsplat, Evike and Redwolf, priced at about $60. This puts it at a lower price than AI Tornado grenades, which frankly, are the best performing (in some situations, as I'll explain later) airsoft grenades currently on the market, but that shouldn't turn you away from the Deep Fire, because it works great in a multitude of situations. I will explain the specific situations where the Deep Fire MK2 excels, and where it has some slight shortcomings later on in the review. The Deep Fire MK2 grenade is designed first and foremost as a skirmishable replica of the actual MK2 grenade. It is designed to very closely resemble the MK2, however, with largely plastic externals so that it won't knock you unconscious if you take one to the noggin. It is designed with multiple external shell pieces that blow off during firing. Inside the shells, you can fit a variety of projectiles, from BBs both in 6 or 8mm, flour for smoke effect, or whatever else you choose to put inside. This gives you a great variety of options when using this grenade. As mentioned before, the MK2 features largely plastic externals, however, it has machined aluminum internals for durability. The break apart design makes it useable in most terrain surfaces, which gives it a leg up over the Tornado grenade, which only works well on hard surfaces like concrete or hard packed soil. I'll go over the individual parts of the grenade in detail in this section. Starting at the top, you have a steel spoon operated fuse system, just like the real MK2. Safety is accomplished by a steel pin that holds the spoon down and prevents it from coming off accidentally. Firing is a piece of cake, requiring you to pull the pin while holding down the spoon, and throwing the grenade towards your target. Upon releasing the grenade, the spoon will fly off with a satisfying ping, activating the timer, that can be set to your desired time. The body shells are made of plastic and Deep Fire has included both orange and OD green shells. Since the shells blow off while firing, there's a distinct possibility that you may lose the OD colored shells when used outdoors, however, if you paint the inner surface of the shells with a high contrast color, it will be much easier to find. I also recommend doing the same with the inner surface of the spoon, to make it easier to find after it pops off. The plastic body panels are fairly sturdy, but still flexible enough to prevent them from cracking while throwing it. Inside the body, you will find the machined aluminum core. The core is made of multiple pieces which come together very well. In order to adjust the timer, you must remove the lower section to access the adjustment valve. The timer is the biggest issue that I had with the grenade, as it was tricky to adjust to exactly where you want, and it didn't seem to consistently hold the desired setting between multiple firings, however, I did find a solution for it. After experimenting with different internal lubricants, I settled on Airsoft Innovations Tornado grenade silicone oil, which keeps everything moving smoothly. It is heavier weight than most other silicone oils, which worked really well for some reason. Now, after lubricating it every 5-6 firings, it's kept its chosen timer setting within a second or so, and it has kept that setting since then. You adjust the timer by holding the top of the rod that pushes the spoon off, and rotating the lower portion of that rod. Turning it clockwise increases the time, and can be tightened up so much that it won't fire at all. You will want to loosen it in small amounts until it fires off at your desired time. This rod is the part that you will want to lubricate, so that it slides smoothly, ensuring the timer works as intended. At the very bottom of the grenade, you will find the brass fill valve, which functions exactly like any other gas fill valve. It fills well, without venting gas all over the place like some pistol magazines that I've used. After firing, you will want to track down your shell pieces and spoon, which will be made easier if you paint the inside with a high contrast color. You can then reset the grenade by reinserting the shell pieces, and pushing the body back together until it clicks and locks together. This makes it very easy to reset and reuse the grenade. When choosing an airsoft fragmentation grenade, the two real options are this, the Deep Fire grenade series, and the AI Tornado grenade. Both have their own pros and cons, however, I personally feel that based on performance, the Deep Fire grenade is more useable in more environments, making it a fine option. Add in the fact that the MK2 only costs 60% of the cost of a Tornado, you can afford to throw a few more of them on your vest to use in games. The timer is a little bit tricky, but if you keep the inner mechanism well lubricated with a slightly heavy weight silicone lubricant, it can be quite consistent. If Deep Fire used this firing system but with an impact trigger, this grenade would be a real force to be reckoned with on almost any field. As it sits, however, it is certainly a skirmishable option, and with some trial and error, you should be able to make your grenade work well for you.